1) As he quite rightly points out, sonically Sunn-O are removed from much of metal, but he should also have noted the affect it has on the listener in an emotional/spiritual sense, particularly when experienced live. The ceremonial nature of their performance is actually, unlike the relentless grind of every other doom metal act (e.g Khanate, recent Celtic Frost material) that I've ever heard, an uplifting and joyous experience; a total embracing of the darkness they (largely wordlessly) articulate, without the aggression and violence that characterises their peers. In many ways, Sunn-O's closet relatives are not within metal, but in spiritual/religious music, such as qawili. Compare and contrast Sunn-O with Nusrat Fateh Ali Khan; lengthy pieces of music (where something clocking in at about 10 minutes could be considered brief), which cycle through seemingly endless repetitions, leaving the listener either in a total tranced-out state or sending them into a state of pure rapture (if you ever see Sunn-O live, take a few moments to cast yr eye around the audience and you'll see what I mean.) In the case of Nusrat, he frequently dispensed with actual words and uses a series of vocal sounds that in many ways express the intense religious love/ecstasy far better than words ever could (even if one does understand Urdu); Sunn-O's vocals, when they are present, are so ridiculously distorted and echo-plexed that even when they sound like words you couldn't possibly make out more than the briefest of snippets (and like Nusrat, would probably weaken the effect). Both artists share the ability to command yr attention without leaving you the actual choice of where to direct it; yr drawn in to their world inexorably; compare that to other doom metallers, where unless you are really on it trying to pay attention becomes something of a chore fairly quickly. Sunn-O's sound, and fundamentally their philosophy, is one of ecclesiastical nihilism. It goes deeper than"revelling in the jouissance of the terminal" (the words 'revel' and 'jouissance' themselves suggest a level of indulgence and frivolity absent in their sound), but to some sort of religious ecstasy induced through distortion and sub bass. And it is PURE, in a way their peers could never hope to be. Anderson and O'Malley don't refer to their live shows as "sub-sonic rituals" and didn't call the last tour "autumnal bass communion" for nothing. 2) On the subject of Burial, it surprises me that no one has linked his post-rave south London with Joy Division's Manchester as etched out in "Unknown Pleasures", [k-punk interjection. They have - Jon Wozencroft was also very quick to insist on the parallel...] which to my ears sounds like it should immediately be added to the hauntological canon (if such a thing really exists). Sonic superficiliaties such as minimalism, echoes and found sounds in the mix? Check. A sense of mourning infusing both records? Check ("Me and him, we're from different, ancient tribes, now... we're both almost extinct... dreams don't rise up they descend/ but I remember/ when we were young."). Temporal disturbances? Check. (Joy Division and Hanett's gutting+spectralising of rock* tunes, e.g war pigs, maps almost perfectly onto Burial's faded 2-step beats and rave synths. Not to mention Wilderness' "I travelled far and wide through many different times" line, which in many ways strikes me now as UP's key lyric; the isolation and despair expressed by Ian Curtis stemming from knowing that which others do not remember and cannot know). Both records create seemingly accurate yet entirely mythical representations of the areas most closely associated with the two artists; a kind of map to orientate yrself with if you've no previous knowledge of the area, which you'll find shows landmarks that no longer exist upon arrival; just rubble, boarded up windows and flyers from over a decade ago peeling of the walls. Also, they are both associated with scenes (post-punk and dubstep) that they both still seem so far removed from; even the core proto goth groups like The Cure and The Banshees don't really fit neatly with JD; whereas they sound tortured but alive, JD and in particular Ian Curtis (as you've noted before) already sound dead, and Burial clearly operates in a different space to his dubstep peers, as previously discussed by pretty much everyone who has voiced an opinion on the subject. Perhaps the strongest link between JD and Burial is this sense of being alone, falling through the little gaps and cracks in time into a place where they've always been and always will be, totally separate from their contemporaries and their successors (I imagine that like Joy Division no one will be able to go anywhere near Burial's musical terrain, both sounding like the aural equivalent of those little time capsule things with artifacts of today's world that get buried for school projects and such like; despite being reflections on the past, they've also exhausted the final alternatives for their particular musical format). * Kevin Shields described MBV's sound as rock minus its guts, "the remnants". Whilst I've never been convinced about this as a description of MBV, I can't imagine a better description of JD exists. The devotional aspect of Sunn O)))'s sound raises interesting questions. 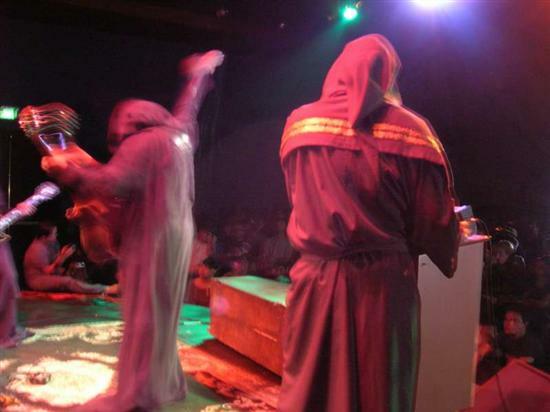 Like Dubstep, Sunn O))) live are lullling, enwombing, rather than oppressive. (Almost the reverse of MBV who, could reputedly be a violent and visceral live.) But then again, Xasthur are curiously calming, too, if you play them at an ambient volume. (The lack of tension-release, the swampy viscosity, make Xasthur excellent background music, really good to work to.) Which poses the question: how much of Xasthur's nihilism comes from the sound, and how much from the words - or more precisely (since the lyrics are all but inaudible), the titles?